Welcome to our very first Coffee time with artists! What I want to do is to show case some other watercolor artists' work as well as do a small interview with them. There are many great watercolor artists out there, and the ones feature in my blog are the artists whom I want to study from as well. I hope you enjoy this new addition series to my blog as much as I enjoy putting them together. 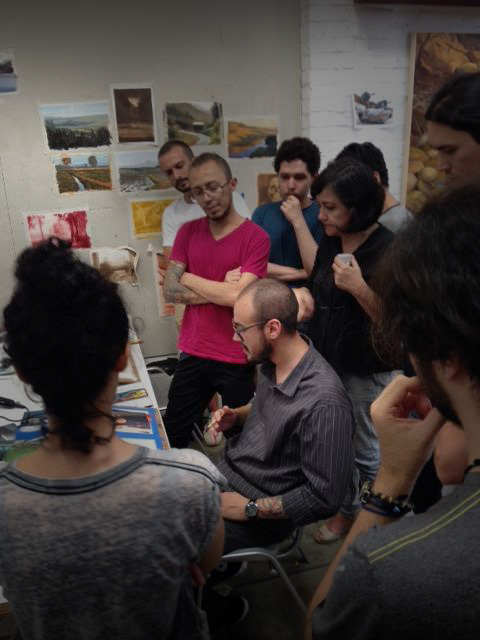 Marcos Beccari is a Brazil based watercolor artist and a professor at UFPR (Public university in Curitiba, Brazil). His paintings are consider realism. If you read my previous post about "why I don't paint photorealism", you probably wonder why I feature Marcos' work. And that is because I don't consider his work Photorealism. Marcos' paintings look realistic not because he copied photo 1 to 1 and render every little detail. His paintings look real because of his unparalleled understanding of lighting, surface materials, and the watercolor medium. Let's look at some of his gorgeous paintings! Marcos paintings look real because of his unparalleled understanding of lighting, surface materials, and the watercolor medium. Eric: Tell us your background, have you always been a watercolor artist? What medium and style did you paint with before you start with watercolor? Marcos: I actually never painted anything but watercolor. I've tried other techniques, but I've never gotten used to it. I started painting at age 18 and I sought realism from the beginning, but it was only at age 27 that I felt safe to show my works. My background is perhaps the drawing itself. I always loved drawing the human figure, especially at live-model sessions. But I do sketches all the time, and in the classroom I teach charcoal drawing. Eric: To many people your paintings are photorealism. But what does realism mean to you? Marcos: Good question, I always wonder about this: What do we really see when we lay eyes on something? What do our brain perceives? I think realism is not merely copying the reality. To paint realistically means trying to assimilate the way other people see, that is, not just what we want to see. But I do not consider my work as a "photorealism". I use photographs as reference, but with caution. Visually, photographs are limiting because the camera cannot see into shadow as well as our eyes can. But photographs can indicate where the shadows are well and make it easier to simplify values. So realism means knowing how to simplify reality. It is not very simple because it implies representing an “impression”, with a focal point and secondary areas. Realism means knowing how to simplify reality. Eric: Who are some of your favorite artists? Marcos: My main reference artists are Anders Zorn, John S. Sargent, Joaquín Sorolla, Edward Hopper and Saul Leiter (photographer). Among the contemporary watercolor painters, there are many who inspire me: Alvaro Castagnet, Joseph Zbukvic, Tim Wilmot, Liu Yi, Mary Whyte, John Yardley, Direk Kingnok, Chien Chung Wei, Myint Naing, Eudes Correia, Gonzalo Cárcamo and many others (like you, Eric, whose beautiful work I discovered recently). Eric: You have published a book Articulações simbólicas: Uma nova filosofia do design in Portuguese. Unfortunately I can't read Portuguese. But it seems that you have a lot of thoughts about design philosophy. How do you incorporate designs in your painting? Marcos: It's hard to answer, because I'd rather study design than do design (I've never worked as a designer). My academic work is more focused on philosophical issues of design, like Aesthetics and Visuality Studies. At the same time, as a teacher of drawing and painting I like to study art history, with some emphases: old masters’ color (like Vermeer), the academic tradition (like Bouguereau), the plein-air movements (from Turner to the post-impressionists) and the American realism (like Liepke). From them I extract some principles that I teach and incorporate into my paintings, like the figurative elements (shape, edge and value), the color relationships, the visual composition, the atmosphere and the mood effects. Eric: What are the most common problems you see in your students? What suggestions do you have for them? Marcos: I'm convinced that I have the best students, because they bring me new challenges to be solved every day. Some of the common problems I see are: lack of form in the shadows, uncommitted values and cast shadows, attempting style without experience, lack of fundamental understanding of forms etc. But most of the time it is simply a fear of failing. And it is not easy to realize that failures are a necessary part of learning. I have made hundreds of mistakes, some of which I torn up, some of which made into a frame and shouldn't have. Every day I look back and wish all my paintings (including the last ones) were better, but I know I did the best I could at the time. When you make mistakes, you are willing to take risks. No one gets better without taking risks. But how would we get any better if we only take risks? It is especially critical in watercolor, as it is a medium that will allow for very few corrections. My suggestion for this is the most standard one: repetitive and obstinate practice, with the humility to seek guidance and with the care to learn from our own mistakes. Not only a great artist, Marcos is also a great teacher, as well as a terrific person. You may visit his website here. His mesmerizing painting inspires me everyday. Even though I paint in a different style and different subject matters, I learn much from his works. Moreover, it is interesting to know Marcos' strong believes on the solid fundamental skill. What we see from Marco's work is the result of his solid training from his age of 18-27 (9 years!). I urge everyone (including myself) to never stop pursuing a stronger core fundamental skill and knowledge. Style and personality will only come after you establish a good foundation! A huge thanks to Marco who agreed to be featured in my blog and took his time to answer my questions. I hope I will be meeting him one day in person and bring you more valuable perspective from him!